Ireland, a devoutly Catholic country that decriminalized homosexuality only 24 years ago, is poised to elect its first openly gay prime minister next month. 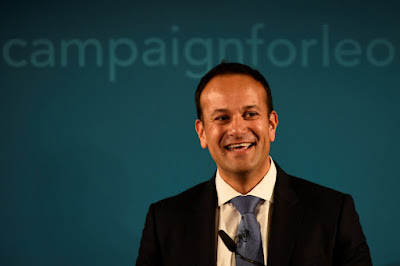 Leo Varadkar, 38, the nation’s current minister for social protection, is projected to beat out his opponent, Housing Minister Simon Coveney, for the title of PM, the Sunday Times of London reported. Varadkar became the lead Fine Gael party candidate after former Prime Minister Enda Kenny retired on May 17 after serving for more than six years as the nation’s leader. Varadkar, who is of Indian descent, would achieve at least two other Irish milestones: the country’s youngest-ever leader and its first of Asian ancestry. He would not be the first Irish leader of foreign parentage however — former PM Eamon de Valera was born in New York and is of Spanish heritage. Varadkar publicly announced his sexuality after Ireland voted to legalize gay marriage in 2015. “It’s not something that defines me. I’m not a half-Indian politician or a doctor politician or a gay politician for that matter. It’s just part of who I am,” Varadkar, a physician, said at the time. Though Varadkar’s opponent, Coveney, 44, is a more traditional candidate with roots in Cork and a wealthy political family, Varadkar has garnered more popular and political support. He reportedly is widely favored by members of parliament. Varadkar has described Coveney as “an honorable man” and may offer him a cabinet position. The rivals’ personal lives illustrate their vast differences. Coveney has been pictured toiling in his garden with his three daughters and wife, while Varadkar was dubbed “lonely Leo” for showing up to a glitzy wedding without a date. Varadkar’s partner, Dr. Matt Barrett, is rumored to not enjoy being a political spouse. Varadkar is known for his conservative leanings and bills himself as a visionary. “What I am interested in are the philosophies of the future,” he said, according to The Sunday Times. The party election is June 2, with the parliamentary vote on the PM a few days later.